1. This V-shape aluminum channel has a curved milky difusser, softens the "spottiness" of LED strip lights, producing a more consistent and pleasing light. 2. It's designed for installations at corners, perfect for indoor/outdoor use, such as showcase, under cabinet, window, door frames, bar and so on. 3. Customization available, this aluminum channel is extendable and sold by meter. You can add as many meters as you need and connect them together. 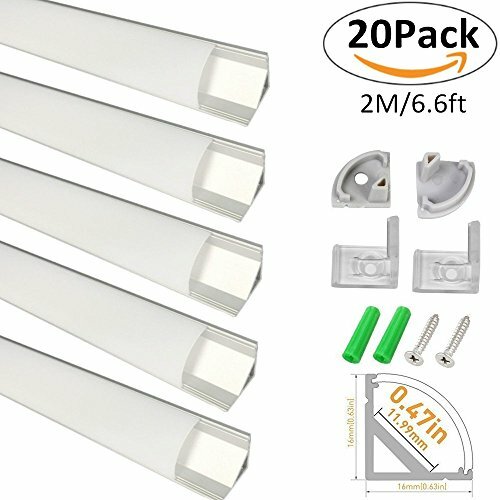 Note: Fit for LED strips that less than 12mm. LED strip light is NOT included in the channel. Fit for PCB width <12mm LED Strips,such as SMD3528, SMD5050 & SMD5630 single row LED strips. Oyster white cover: provide a well diffused light that is comparable to neon effect, protect delicate strips from dust and physical contact. It's designed for housing decorative at corners, perfect for indoor/outdoor use, such as showcase, under cabinet, window, door frames, bar and so on.